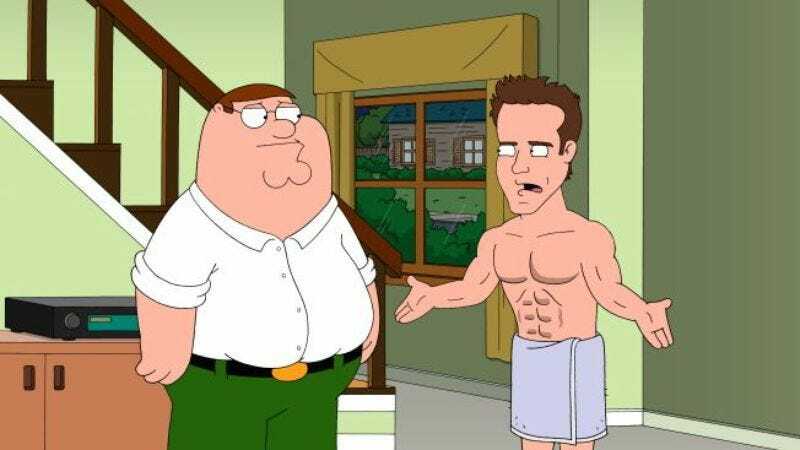 It was disappointing to see Family Guy bury a guest star like Kaitlin Olson in the background for much of her episode as Quagmire’s sister last week, but it was even worse to see the show waste Ryan Reynolds, tonight playing a version of himself that becomes obsessed with overtly seducing Peter while shooting a movie in Quahog. 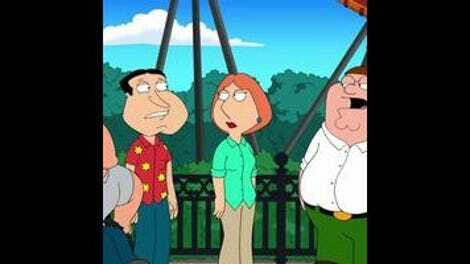 Peter and Lois meet Reynolds after Peter spends the first two minutes of the episode acting like a child, wanting congratulations for getting a shot like a big boy and pointing out a fire truck to Lois. Then Reynolds drives in, ignores Lois, takes a shine to Peter, and zooms away. Then there’s a cutaway to Peter meeting Shelly Duvall, and Peter swears, instantly jolting away from the initial childhood state for absolutely no reason. That’s the kind of unsubstantiated, illogical start that keeps me thinking nobody has any idea how to break a story in that writer’s room. It has no reason to exist other than to introduce Reynolds as the guest star, and it manages to make that uninteresting and devoid of humor. So Ryan Reynolds is hitting on Peter, or at least Peter thinks he is. The whole thing plays out like a much less extreme reversal of “The Story On Page One,” the season two episode where Peter attempts to seduce Luke Perry in a black thong swimsuit. That episode had a comedic build to it, moving from Meg’s lackluster college visits, to Meg joining the school paper due to a need for extracurricular activities, to Peter intervening when Meg did an investigative report on Mayor Adam West. It combined the Griffin family with Peter’s comedic meddling, and it was a good example of how Family Guy had seemingly found the Simpsons formula of taking left turns towards the main plot of an episode for a brief spell early on in its first run. “Stewie Goes For A Drive” had none of that same escalation, instead beating the same joke into the ground, having Ryan Reynolds referring to how he looked in tight clothing and asking Peter if he looked good. That was really the only joke that came out of Reynolds’ appearance. Peter went to his house, went to get Moroccan food, but there was none of the same going-for-broke comedy that put Peter in seduction mode around Luke Perry, or the twist with Perry and Adam West at the end of “The Story On Page One.” Time and time again Family Guy comes off as lazy and derivative, and this was yet another example. The B-plot gave the episode its title, which was another strange decision. Stewie accidentally shifts Brian’s car into drive while listening to the end of Carrie Underwood’s “Before He Cheats” and gets hooked on the possibility of going out for a spin. The best scene in the episode was the short one where Stewie snagged Brian’s keys while he sits at the kitchen table narrating an outline to another pompous novel to himself (the protagonist is Norm Hull, for the scholars 100 years from now). Even if it is for one brief second, the show manages to encapsulate what makes Brian such an insufferable, snobby pseudo-intellectual and yet unable to get past the outline stage of his next failed novel. He isn’t yearning to create art, only the recognition and devotion of hypothetical scholars. If that seems like making a mountain out of a molehill, just remember how hard it is to pick one well constructed scene that actually makes sense for these characters out of an episode in the past few seasons. I’ll take a reasonably well thought out 30 seconds where I can. As if the Underwood joke at the expense of Top 40 wasn’t enough, while Stewie drives along with Rupert, he hears a radio contest for Justin Bieber tickets and crashes into a pole while using his cell phone. Brian is pissed about the car, naturally, and Stewie is afraid he’ll be in trouble with his parents for some reason after all his previous antics over the course of 10 years haven’t really done anything. He decides to run away from all his problems, leaves Brian a video message that’s he’s left for the airport, and gives detailed instructions for Brian not to come to the airport and re-enact one of the various romantic comedy scenes where somebody gives a big speech in front of all the TSA agents to keep the object of their affection from getting on a plane. That moment plays fine, but Stewie actually had no idea where he was going, and he ends up lost in an unfamiliar part of town, where Consuela, former maid to the Griffins, shows up out of nowhere to take Stewie to her house, at which point we’re obviously in for some off-the-mark low-class humor and racial humor that had me sighing at its ineptitude. Both plots paint themselves into a corner with no time to get out. In the third act, Stewie is trapped at Consuela’s house and Peter hadn’t succumbed to Reynolds’ repetitive and slowly escalating advances or done anything about them, so the show snaps its fingers and ends each one prematurely. Brian figures out he can use his nose because, you know, he’s a dog, and dogs have a great sense of smell, of course. But Consuela doesn’t want to give Stewie up, so he pulls a gun out of nowhere and starts shooting so they can walk out without a problem. End of B-plot, with no explanation, on an unsatisfying note with no real resolution. The Reynolds plot didn’t really even have an ending. The final scene with Peter and Ryan makes things a bit too sinister. Peter goes over to Reynolds’ house to politely rebuff his advances, to which Reynolds feigns ignorance. The polite rejection is already somewhat out of character for Peter. He’s normally so larger-than-life that this evenhanded response to an extremely awkward scenario was surprising. As expected, Reynolds has no idea what Peter is talking about, but in kind of a sick twist, he doesn’t just give up at Peter’s rejection. Instead, he chips away at Peter, emotionally manipulating him by saying that just because he’s attracted to Peter “in the way a man is attracted to a woman” it doesn’t make him gay, because he’s above punitive labels like “gay” and “straight” altogether. This idea puts Peter in the lesser category where he still subscribes to those societal norms, and then Peter is suddenly more intrigued by the possibility of Reynolds. It was uncomfortable to watch Ryan Reynolds as a conniving sexual predator, shaming Peter into giving him what he wanted, but even more baffling that the scene just cut off with Reynolds handing Peter a cell phone. That’s only half of a resolution, and with only two minutes left, it only had time to show Lois and Peter talking about what happened up at Reynolds’ house, which is interrupted by a callback to a cutaway joke about futuristic anti-corporation movies from the 70s from halfway through the episode. That leaves an episode constructed entirely around the idea that Ryan Reynolds is attractive in tight clothing, an idea that doesn’t come across in an animated version of the actor. I happen to actually like Reynolds, and I think he’s chosen a lot of bad projects despite some decent comedic talent (Green Lantern, Van Wilder, Just Friends, most of his filmography). He may not fit an empirical definition of a movie star, but I think he’s worth more as a guest than a tired trope like playing himself as a sexual predator towards Peter. Unofficial Cutaway Counter: Nine. Quite a few this week. Best tangential joke was probably the extended 70s anti-corporation movie that Stewie sees on TV. I tend to not like the long cutaways, but it was rather slim pickings this week. The worst was the first cutaway, to Peter sitting in a doctor’s office and complaining about an autistic woman. It didn’t seem edgy to make fun of someone like that, just unnecessary. A possibly offensive joke that I thought landed: Ryan Reynolds is in Rhode Island to shoot a movie where he plays Hitler, aptly titled Hotler. Hollywood leaves no stone unturned in the remake/reboot game. Chris, Meg, Quagmire, and Joe are a few of the characters that didn’t make an appearance tonight. Of course Herbert the creepy old man wins the Justin Bieber tickets. Never say never. Absolutely no one is surprised that Peter hates Lois’ book club, but why is it on Thursday nights? It’s clear that Family Guy doesn’t understand that its racial jokes are actually offensive instead of skirting the line. Like I’ve said before, I want to give the writers the benefit of the doubt, and think that they’re being lazy and attempting to write cultural clichés as jokes, but the Consuela character in particular makes me deeply uncomfortable.